This isn’t what you pictured when you were planning your trip to Acadia National Park in Maine. Traffic jams, congested parking lots, and crowds trying to catch the thunder at Thunder Hole. People come from all over the world to see the incredible natural beauty of Acadia National Park–but what happens when those gorgeous views are blocked by crowds of people? If you’re visiting during the high season of summer, that will be you. While the main part of Acadia on Mount Desert Island easily has enough hiking trails, scenic views, and harbor towns to keep you busy for a week or more, there are other sections of the park nearby that are much quieter. And if you’re like me and prefer more nature than people, this post is for you. I grew up exploring all corners of Maine with my outdoorsy family, and today I’m sharing some lesser known attractions and things to do around Acadia National Park and Down East Maine. 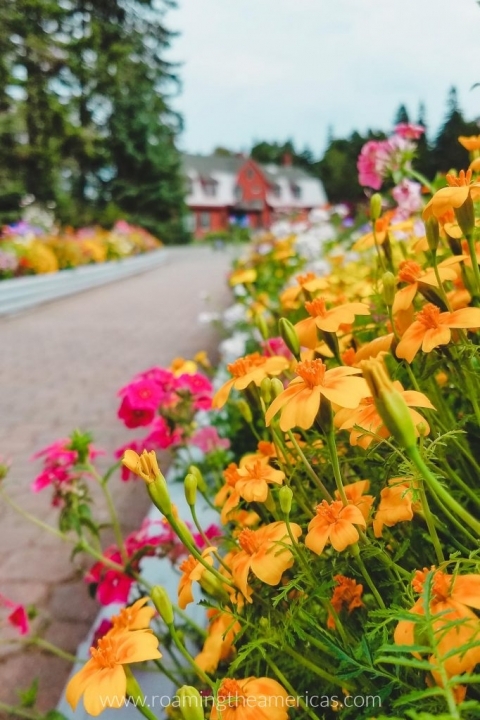 Whether you want to take a day trip from Bar Harbor or skip it altogether for these other coastal villages, I think you’ll love getting off the well-worn tourist path to explore. Planning a trip to Maine? Pin this post to your travel board on Pinterest to keep it bookmarked! Note: Some of these places require a bit of driving (but make for a great coastal road trip). Head to the bottom of the post for a map of all these locations if you want to visualize where they are in relation to Mount Desert Island. The Schoodic Peninsula is home to a harbor town and a small section of Acadia National Park that’s especially popular for biking. You can drive here from Mount Desert Island (MDI) if you’re planning to stop at the reversing falls or head farther up the coast. Otherwise, save on gas and take a ferry across from Bar Harbor (along with your bike). The Island Explorer bus also offers service in and around the peninsula during the summer season. In Winter Harbor, check out the five and dime store or enjoy a performance or art workshop at the community arts center, Schoodic Arts for All. Explore the side streets on Grindstone Neck as you make your way down to Grindstone Point to enjoy the gorgeous (uncrowded) views of the bay, islands, and a lighthouse. Take in the views from Schoodic Point and other stops along Schoodic Loop Road. Or enjoy the 8+ miles of bike paths in the park! Stop by Frazer Point to read its fascinating history. It’s named after an African American man who was the first non-Native American to settle on the peninsula in the late 1700s. He sold salt to fishermen passing by that needed to preserve their catch. Frazer Point was also the location of a summer campsite for the Wabanaki people for thousands of years prior to that. Enjoy a picnic at Sullivan Falls, where the freshwater meets the ocean and you can watch the rapids reverse as the tide changes. Aside from watching this unique natural phenomenon, you might spot some wildlife fishing in the nutrient-rich waters. According to the Frenchman Bay Conservancy, which owns and preserves the land, the best time to view the falls is 2 hours before or after low tide. Note: While this isn’t on Schoodic Peninsula, it’s a convenient stop off Route 1 as you’re driving from Mount Desert Island. Also, there are no dogs allowed. It feels like you’re driving to a little secret spot as you make your way through the small towns and coastal road that lead to this photography gallery meets lobster shack. Stop by for some Maine foodie treats: lobster rolls (obviously), haddock chowder (ahem, chowdah), blueberry pie, whoopie pies, and more. Eat your lunch on the wharf overlooking the bay and surrounded by lobster boats and traps, and then get a glimpse of Maine coastal life in the 1940s, 50s, and 60s as you peruse the work of local photographer Louise Z. Young inside the gallery. The beautiful Blue Hill Peninsula is located to the west of Mount Desert Island and is home to seven small villages. It’s also connected by Route 15 to Deer Isle (often referred to as Deer Isle-Stonington in reference to the island’s two towns). Once a haven for granite mining, Deer Isle now thrives on tourism, lobstering, and artists. 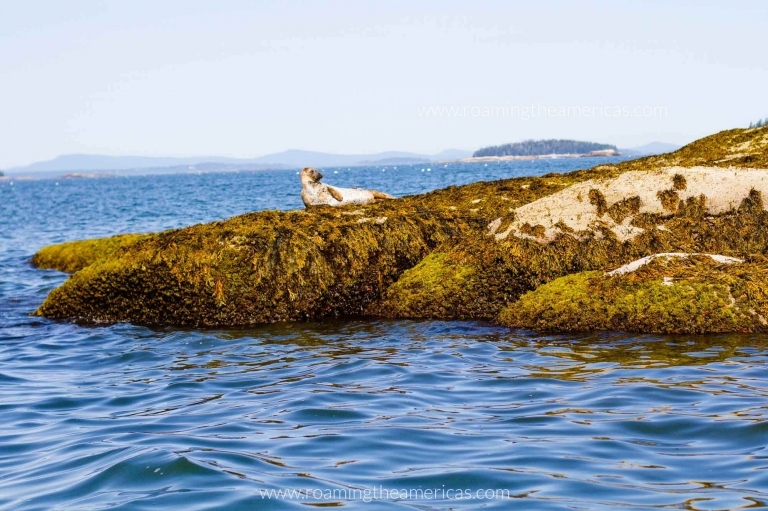 Getting out onto the water off the coast of Deer Isle is an unforgettable experience. While I haven’t kayaked these waters, I was able to head out on a lobster boat here a couple summers ago. My love for inland Maine is no secret, but this area may have won me over. I fell a bit in love with the Maine coast on that trip, and it left me longing to return. Merchant Row is a cluster of more than 50 islands between Stonington and Isle au Haut that were prized for their granite during the granite boom of the late 1800s and early 1900s. Now two-thirds of these islands are protected in one way or another, with eight of them being part of the Maine Coast Heritage Trust. Naturally with so many of the islands being open to the public, this area is a sea kayaker’s paradise. Experienced kayakers can put in at various public launches around the island and set off on their island-hopping adventure, while beginners can opt for a guided trip with one of several outfitters on the island. 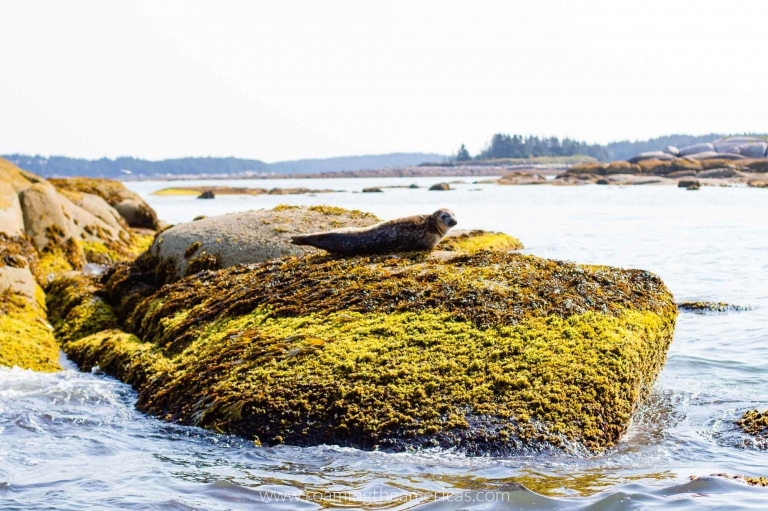 For those who prefer to stay land-bound, there are nature preserves all over Blue Hill Peninsula and Deer Isle–full of trails, coastal views, and granite quarries. The chamber of commerce offices have lots of information and trail maps for those looking to explore on foot. If you really want to get away from the crowds, take the mail ferry from Stonington to the most remote part of Acadia National Park, located on Isle au Haut (pronounced “eye-la-HO”). While I’ve only had the chance to pass by on a lobster boat, it’s on my list to visit soon because the views from the water off the coast of Stonington are spectacular. The park takes up about half the island, while the other half is home to a year-round island population of just a few dozen people (growing to a few hundred in the summer). 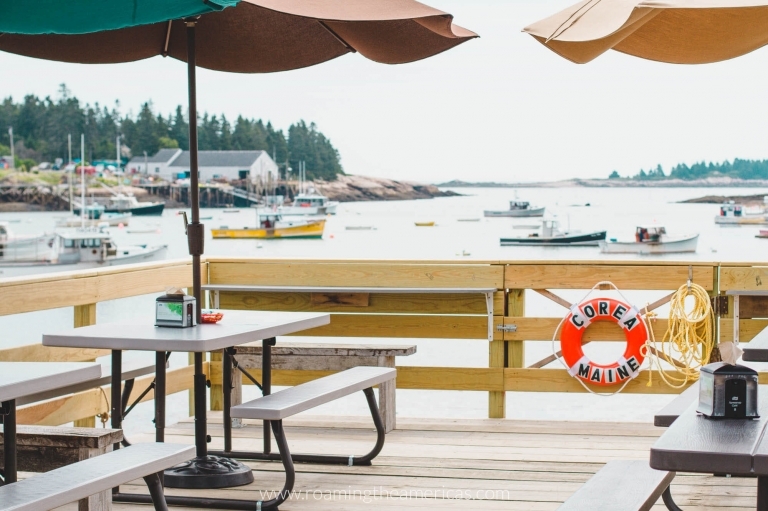 With few tourist trappings (an inn, gift shop with local products, lobster truck, and a small grocery store), this is the perfect way to enjoy nature’s tranquility on the Maine coast. You may even want to extend your island trip to several days–stay overnight at one of the park’s remote campsites, or enjoy a bit more comfort at The Keeper’s House Inn. 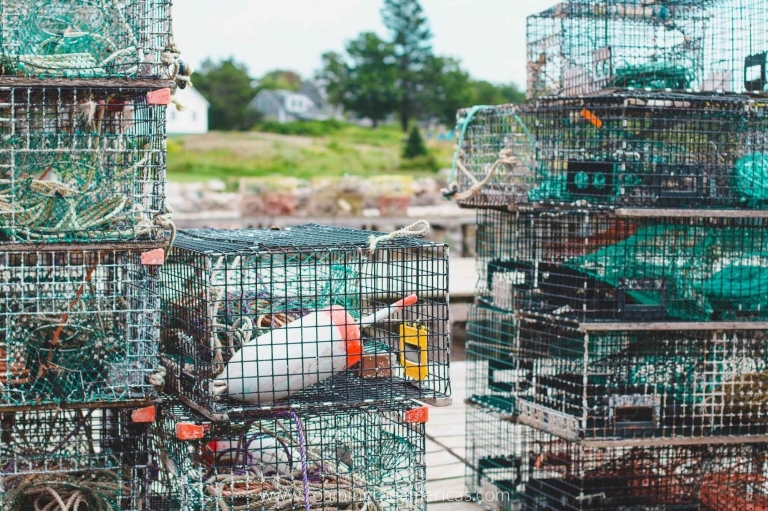 In a state known primarily for its lobster production, Stonington is the capital–despite its visible lack of tourist traps. 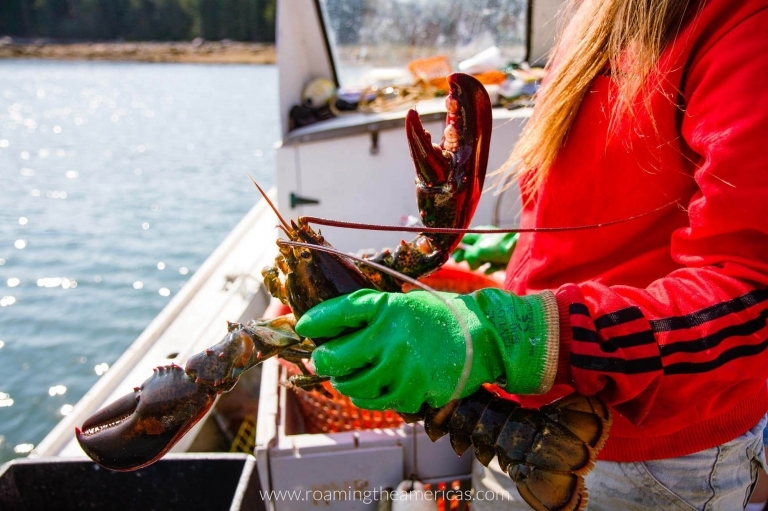 It’s the top-producing lobster port in Maine year after year, and lobstermen can be seen hauling their catch all day long, especially during the summer and fall months. 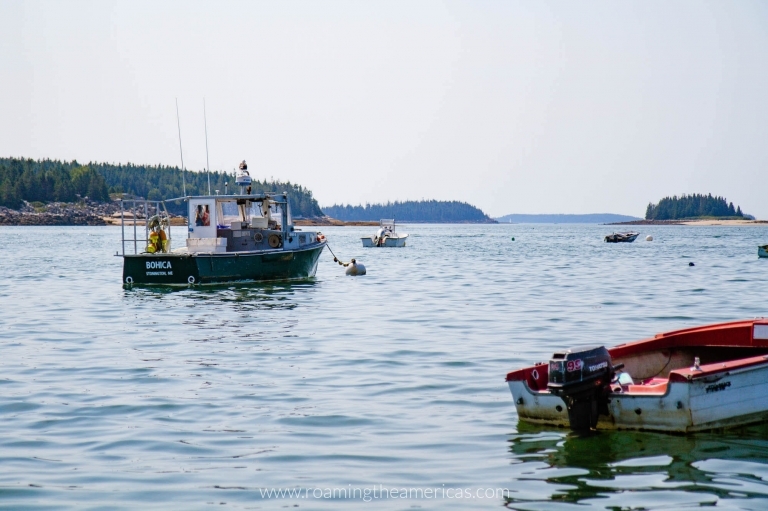 In July, there are even lobster boat races in the harbor! Counterintuitively (unless you understand sailing and the direction of the winds, which I don’t), “Down East” Maine refers to around Blue Hill and Mount Desert Island all the way to Canada. To go farther Down East means you are traveling up the coast towards Canada. It’s a long haul, but if you’re willing to sacrifice the time it takes to drive these roads (and I think you should take the scenic route and get a little lost whenever possible), you’ll be rewarded with beautiful views and very few crowds. Drive a couple of hours from Bar Harbor along a scenic byway and you’ll find a hike that absolutely rivals Acadia’s beauty. Despite only doing the short hike through a maritime forest to the cliffs and back out (about 3 miles)–with the majority of my time spent in the forest–the views at the end were spectacular (and I kicked myself for not allowing time for the full loop). There are two other trail options: a small loop (5.5 miles) with more hiking along the cliffs, or the longer loop (9.2 miles) with a significant portion of the trail following the shore front. If you want to take your time, there are primitive campsites available on a first-come, first-served basis. 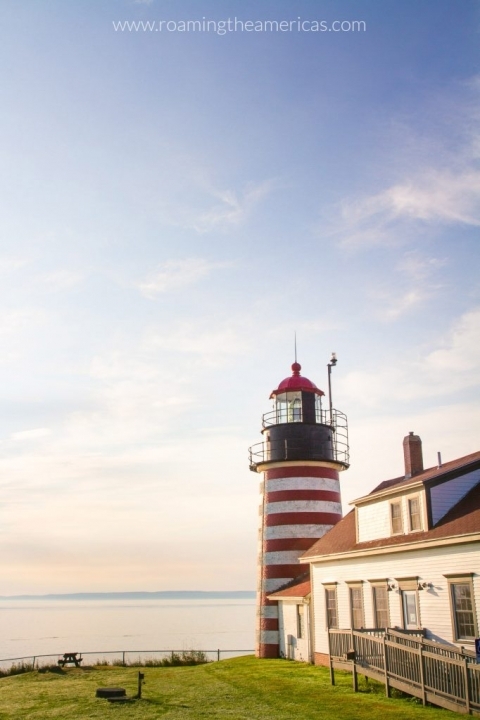 West Quoddy Head Lighthouse is definitely off the beaten path in Maine…But it’s worth the trip to visit the only candy-striped lighthouse in the United States AND the easternmost point in the continental U.S. As far as being the first place to see the sunrise? That’s where things get a little technical, and this location competes with two other spots in Maine (top of Cadillac Mountain and Mars Hill) to see the first sunrise, and Quoddy Head can only claim the title 34 days per year. The lighthouse is located in Quoddy Head State Park, and there are several short hikes here to enjoy as well–some with ocean views. Roosevelt Campobello International Park is located on Campobello Island in Canada, just over the bridge from the cute village of Lubec. As long as you have your passport, you can simply drive over the bridge and arrive in the park, which is where Franklin D. Roosevelt spent many summers as a kid and into adulthood. You can take a free tour of the historic home and grounds, and go off exploring some of the scenic overlooks or nature trails. Head to the Cobscook Bay area on the border of Canada to find the largest set of tidal falls in Maine. A huge ledge under the channel at Reversing Falls Preserve prevents the normal flow of water between the ocean and the river. This is accentuated further by the dramatic tides in this region that rise and fall up to 24 feet in 6.4 hours, causing high swells, whirlpools, and waterfalls to occur here throughout the day.